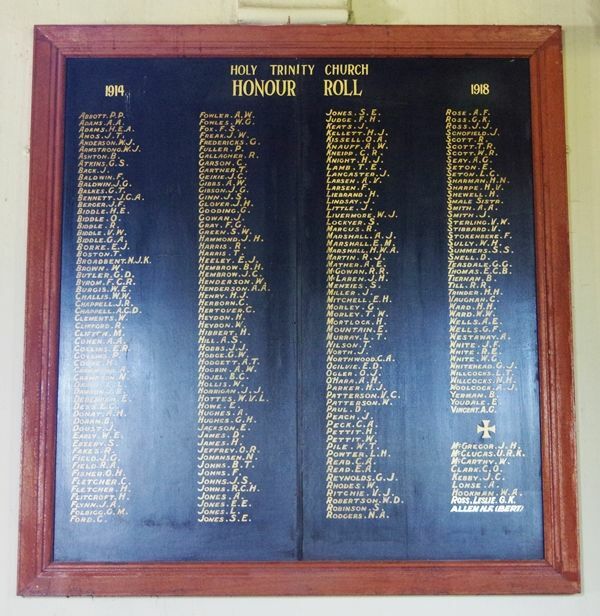 An honour roll situated on the northern wall of the Church commemorates those from the parish who served in World War One. In the presence of a large congregation, in which there were included the Mayor (Ald. W. A. Dibley) and aldermen of the municipality, the Shire President a contingent of returned men, an honor roll bearing the names of the men of the parish who served in the Great War was unveiled and dedicated by the Ven. Archdeacon Forster at the morning service at Holy Trinity on Sunday last. When the pipe organ was installed it was dedicated as a memorial and the names of those who had made the supreme sacrifice were inscribed on a tablet, with the intention that the whole of the names of those who had enlisted should be subsequently recorded, and Sunday last marked the consummation of that desire. Towards this end the co-operation of the parishioners was readily given, special credit being due to the efforts of Mrs. W. Russel. After a solemn dedicatory prayer, the honor roll was unveiled, when the Archdeacon delivered a brief address. On the honor roll there were the names of 270 men of the parish, said the Ven. Archdeacon, who had offered themselves in the Great War, and nearly 25 per cent, of that number were called upon to make the great sacrifice. The organ, when installed, was dedicated as a splendid memorial, but only the names of those who were killed were placed upon the roll of honor, though it was always intended that the names of all from the parish who offered to serve the Empire, whether they were called upon to pay the last tribute or not, should at some later time be included. And that was as it should be. Glen Innes Examiner (NSW), 24 May 1932.